Birch K. (2018) We must consider what can happen if our personal data become a private asset, The Globe & Mail - Report on Business (26 November 2018). Birch, K. (2017) From Entrepreneurship to Rentiership in Technoscientific Capitalism, Department of Business & Politics Blog, Copenhagen Business School (16th August). Birch, K. (2016) How to think like a neoliberal: Can every decision and choice really be conceived as a market decision?, LSE Impact Blog (29th January) [reposting of Discover Society piece]. 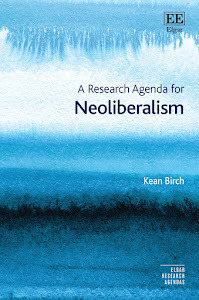 Birch, K. (2015) How to think like a neoliberal, Discover Society 22 (1st July). Birch, K. (2015) Critical dialogue – Response to Brett Christophers’ “Monopolizing Neoliberalism Away”, Antipode Foundation website (7th April). Birch, K. (2015) Ponzi property: The neoliberal delusion of homeownership, ROAR Magazine (22nd March). Birch, K. and Tyfield, D. (2015) Theoretische Überlegungen zur Bioökonomie: Biowert, Biokapital – oder was sonst?, PROKLA 178(1) [Reprint in German]. Birch, K. (2015) Origin Stories of the Corporation...and the State [Review of Corporate Sovereignty by Joshua Barkan], Antipode Foundation website (February). Birch, K., Braun-Jackson, J., de Robertis, M., Heron, C., Khayatt, D. and Wellen, R. (2015) Report: Taskforce on a Strategic Vision for York University, York University Faculty Asssociation. Birch, K. (2014) What happened to the Lisbon Agenda?, SPERI Comment: The Political Economy Blog (8th April). Birch, K. (2014) The Lisbon Agenda: Financialising Europe’s economy, New Left Project website (5th March). Birch, K. and Wudrich, D. (2013) Climate change, sustainable infrastructure and the challenge facing engineers, Engineering Dimensions (Sept/Oct): 46-48. Birch, K. (2012) It’s not just the 1%, New Left Project website (23rd November). The SIGJ2 Writing Collective (2012) "Tim-adical” action: A reply to Culum Canally, Antipode Foundation website (8th November). Birch, K. (2012) Manifesto for a doomed youth: The return to serfdom, Canadian Dimensions website (17th September). Birch, K. (2012) Intervention - We have never been neoliberal, Antipode Foundation website (15th May) [Slightly revised reprint]. Birch, K. (2012) Intervention – The brutal lives of others: Exploitation in the academy, Antipode Foundation website (4th May). Birch, K. (2012) We have never been neoliberal, New Left Project website (19th April). Birch, K. (2010) The end of the Green New Deal? We simply don't have time for this austerity, Zed Books Blog (1st October). Birch, K. (2007) Die neoliberale Untermauerung der Bioökonomie: Ideologische Diskurse und Praktiken der ökonomischen Wettbewerbsfähigkeit, Gen-ethischer Informationsdienst, Special Supplement No. 7 (Dec 2007): 19-29 [Abridged reprint in German]. Cumbers, A. and Birch, K. (2006) Adding Value: Public Sector Spending and Scotland’s Economic Development, Glasgow: Report for UNISON Scotland.